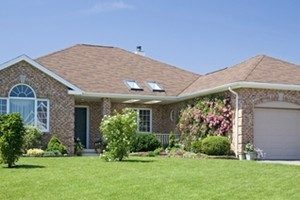 When looking to increase curb appeal, there are a few factors to consider. A fresh paint job, the condition of windows and the cleanliness of the front yard are all important, but one of the best things a homeowner can do is update their garage door. When a potential buyer pulls into a driveway the first thing he or she sees is the garage. Its size makes it stand out more than the windows and front door, making it essential that the garage door looks good and operates as intended. According to Garage Wow Now, the garage door is the most noticeable architectural element of the modern home. As such, 71 percent of homeowners who recently replaced their garage door believe it definitely increased the value of their home. There are many factors to take into account, such as the style, color, security and function of the door, but these can be determined by looking at the rest of the house, as well as the styles used throughout the neighborhood. Furthermore, it is important to consider the garage door’s durability. What types of storms or natural disasters threaten the area, and can the new door stand up to them? Sometimes improving curb appeal doesn’t mean completely replacing the garage door. Maybe it just needs an upgrade. A new paint job and opener can do the trick just as well as an entirely new system. Genie of Fairview Door Co. offers top quality garage door parts, systems and services for all your home improvement needs.